At Breadsmith, we’re committed to being actively engaged in each of the communities we serve. Through partnerships with local non-profit organizations, we demonstrate our commitment to community involvement through product and gift certificate donations, sponsorships of local events, and community fundraisers. Our bakeries also take advantage of locally sourced products when making their baked goods. In addition, each Breadsmith location donates its unsold baked goods to local food pantries at the end of each day. 100 tons seems like significant amount. That’s because it is! At the end of each day, our neighborhood bakeries donate their unsold bread to local non-profit organizations, food pantries and soup kitchens in the communities they serve. In fact, more than 200,000 lb. of artisan bread is donated to those in need each year. Want to learn more? 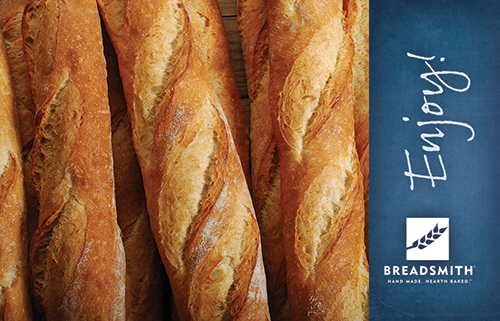 We invite you to contact your local Breadsmith for more information. Preventing hunger by providing nutritious food to people in need is a critical aspect of Hunger Task Force’s mission. For several years, all four Milwaukee area Breadsmith bakeries have teamed up to raise funds and awareness for this important cause during a one-day community fundraiser. In addition, team members from Breadsmith’s franchising office have volunteered at the organization’s local farm, harvesting and washing nearly 500 pounds of locally grown lettuce and other vegetables. Several Breadsmith bakeries use local fruits, honey and eggs in the production of their made-from-scratch baked goods, while also offering regional favorites such as jams, jellies, and oils in their stores. For example, a team member at Breadsmith of Appleton (WI) grows and harvests a variety of locally grown zucchini for use in that bakery’s fresh from the oven dessert breads.